U.S. Warns Germany About Possible Repercussions Of Using Huawei For 5G Network The U.S. ambassador sent a letter to Germany's economy minister reportedly saying that if Chinese tech companies such as Huawei help build Germany's new 5G telecom infrastructure, things might change. The U.S. has warned Germany about possible repercussions of using Huawei in its upcoming 5G mobile network, citing security concerns. 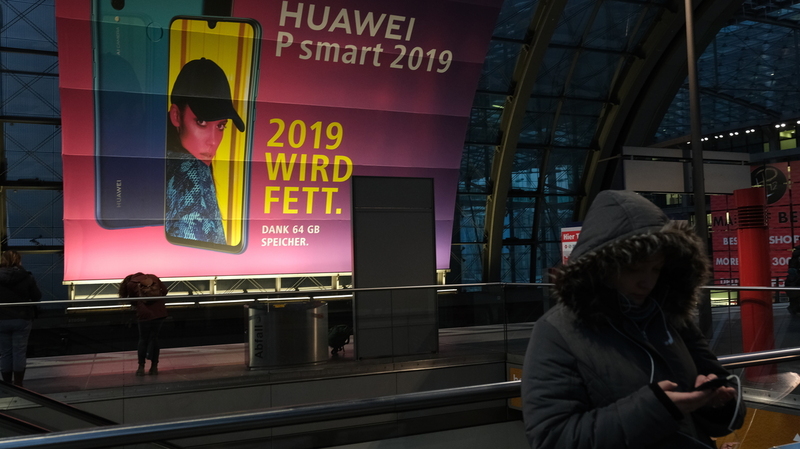 Here, a billboard for the Chinese telecom giant is seen in the Berlin Hauptbahnhof railway station. The U.S. has apparently warned Germany that if Chinese tech companies such as Huawei help build the country's new 5G telecom infrastructure, U.S. agencies might not share as much intelligence with the German government as they currently do. That's the gist of a letter U.S. Ambassador Richard A. Grenell recently sent to German Economy Minister Peter Altmaier, according to The Wall Street Journal, which first reported the news. "A U.S. Embassy spokesman told NPR in a statement that he would not comment on the contents of the letter," NPR's Joanna Kakissis reports from Munich. "But he added that the U.S. position on 5G network security is well-known." The U.S. has repeatedly urged Germany, Canada and other allies not to use Huawei — China's largest telecom equipment-maker — to build sophisticated new telecommunications networks, saying the company has possible ties to Chinese intelligence agencies. Huawei has denied that it spies for China. But suspicions have increased enough that the company's founder and CEO, Ren Zhengfei, tried to quash them earlier this year, when he said, "No law requires any company in China to install mandatory backdoors." Zhengfei said he wouldn't harm his customers' interests or his company's prospects. Altmaier apparently received the U.S. letter on Friday — one day after he said Germany doesn't want to put an outright ban on Huawei. Instead, he said, the country plans to "change its laws to guarantee all components used in the 5G networks are secure," as Deutsche Welle reports. The U.S. has been openly skeptical of Huawei's independence since at least 2012, when the House Intelligence Committee issued a report criticizing the tech company over its ties to China's communist government (and possibly the military) as well as a lack of transparency. In Germany, the U.S. Embassy spokesman told Kakissis that the circumstances raise questions about the confidentiality of sensitive communications, implying that information carried over Huawei's equipment could be at risk of being piped to Chinese intelligence agencies. Last week, Huawei sued the U.S. government for banning federal agencies from purchasing Huawei equipment — a restriction in the 2019 National Defense Authorization Act. The tech company says the ban violates the Constitution's Bill of Attainder clause — which, as NPR's Matthew Schwartz reported, "prohibits Congress from singling out a company or individual for punishment without a trial." The U.S. clash with Huawei includes a deep disagreement over the arrest in Canada and possible extradition of Huawei CFO Meng Wanzhou, who is also the founder's daughter. Meng appeared in a Canadian court last week; an extradition hearing is set for May 8 — a date that falls within U.S.-China trade talks to resolve ongoing trade disputes. As scrutiny of Huawei has grown, Australia and New Zealand have joined the U.S. in barring the company from their 5G networks. Italy and Japan are reportedly considering the same move. And other countries have issued security warnings about Huawei and China, including the Czech Republic and Lithuania. In January, Poland's Internal Security Agency arrested a Huawei executive on suspicion of spying for China, in a case that centers on the telecom company Orange Polska.